Coleraine picked up a deserved share of the spoils thanks to David Ogilby’s late first half free kick at home to Crusaders. A Stephen Douglas own goal in the second minute gave the Crues the perfect start, but Coleraine deserved to take something out of the game. The home side made three changes to the side which suffered a 4-0 defeat at Dungannon Swifts. Adam Mullan, James McLaughlin and Neil McCafferty all dropped to the bench, with Lyndon Kane, Jamie McGonigle and Ian Parkhill coming in to the 4-5-1 formation. The Crues came to The Showgrounds brimming with confidence having won seven of their last eight meetings with the Bannsiders. And they got off to a dream start edging in front with only 75 seconds gone. Gavin Whyte’s low ball into the box deflected off Steven Douglas and into the net. It was almost 2-0 five minutes later, but Paul Heatley’s snapshot from 18 yards was pushed away by Chris Johns. Coleraine responded with Davy Kee going close with a powerful effort from 25 yards on 12 minutes. And seven minutes later Ian Parkhill also just missed the target from outside the area after being set up by Darren McCauley. Johns was called into action again on 26 minutes after Owens teed up Declan Caddell, and the keeper did well to push away his powerful effort. 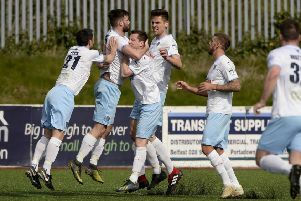 The Bannsiders got themselves back on level terms right on the stroke of half time and it came from the unlikely source of defender David Ogilby. The big centre back coolly stroked the ball home from 20 yards after Parkhill had been upended by Jordan Forsythe. It was his first goal since Boxing Day 2014! The Crues threatened first at the start of the second half as Owens grazed the crossbar with a header from Forsythe’s floated cross. James McLaughlin almost had the perfect introduction after coming off the bench on 69 minutes, but a heavy touch as he bore down on O’Neill’s goal allowed the keeper to smother the ball. Stephen Baxter’s men thought they had retaken the lead with 13 minutes to go as Colin Coates got on the end of Forsythe’s corner, but Johns produced an excellent save to push the header on to the post. At the other end O’Neill produced a wonder save to deny McCauley on 82 minutes. His Dipping volley from Parkhill’s clever flick looked destined for the net but for the keeper’s intervention. Coleraine: Johns, Kane, Brown, Douglas, Ogilby, McGonigle (McCafferty 55), Kee, McCauley, Lyons, Parkhill, Twigg (McLaughlin 67). Crusaders: O’Neill, Burns, Beverland, Coates, Cushley (Clarke 46), Caddell (Soares 75), Forsythe, McClean, Owens, Heatley, Whyte.